HC Lev Praha is going to play four of its regular season games in the biggest and most modern Czech venue. 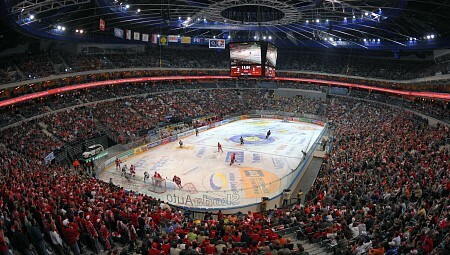 When the move of HC Lev from the Eastern Slovakian town of Poprad to Prague was made official back in May 2012, hockey experts and fans expected them to play all home games in the KHL in the by far biggest and also most modern arena the Czech Republic offers these days, the O2 Arena in Prague. But due to failed negotiations with the arena management and the problems that could occur regarding the schedule as HC Slavia Praha of the Czech Extraliga also uses the arena as their home stadium, these plans were stopped - at least for the near future. Instead HC Lev looked for another venue and found it in the 50 year old Tipsport Arena. The home arena of the Czech Extraliga's HC Sparta Praha, with whom HC Lev plans to have close ties in the future, has been modernized prior to the start of the 2012-13 season to reach the KHL standards. A final decision about holding games also in other parts of the Czech Republic has not yet been made. As the project is seen with mixed feelings by the fans allover the country, HC Lev wants to create a nation-wide identity also fans of Extraliga and other teams can identify with.